Nick Briggs is to portray Winston Churchill in the 'Doctor Who Live' stage show. The actor - who played the wartime British Prime Minister in the episode 'Victory of the Daleks' in the BBC sci-fi series - will reprise his role when the production opens in the UK next month. Briggs will also voice the parts of several 'Doctor Who' monsters, including the Daleks and the Cybermen. The actor's alter-ego will be brought to the stage by a unique new character called Vorgenson - who has been dubbed the 'Greatest Showman in the Galaxy' - who can use his magical invention 'The Minimiser' to summon any 'Doctor Who' character. Vorgenson will be played by 'The Young Ones' actor Nigel Planer, who admits landing the role has made his "boyhood dream come true". He explained: "I'm incredibly excited to be joining 'Doctor Who Live' and this role is something of a boyhood dream come true. My character Vorgenson, who has been developed specially for the show by Steven Moffat ('Doctor Who' executive producer), is the 'Greatest Showman in the Galaxy' and using his incredible invention, 'The Minimiser' he can make any 'Doctor Who' character appear on stage as part of his travelling show dedicated to his hero. I hope I can survive visiting nine cities in October sharing a stage with eleven 'Doctor Who' monsters and a flying Dalek in tow!" British illusionists The Twins - who have taught Hollywood hunk Brad Pitt how to perform magic tricks - will also help bring some of the Timelord's most famous foes to life with a dramatic display of stunts and illusions, while Matt Smith will appear as The Doctor in several video scenes. 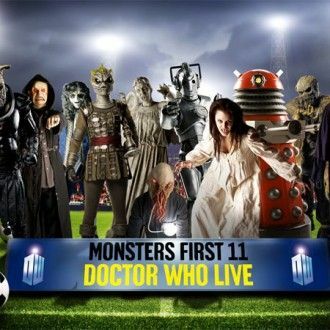 Other enemies set to appear include Judoon, Silurians and Winders.